The price of ether, ethereum’s native token, is closing in on record highs above $400. Soon before press time, the world’s second largest cryptocurrency by market capitalization had hit $413 – a whisker short of ether’s all-time high of just over $414 set in mid-June. As per CoinMarketCap, the ether-U.S. dollar (ETH/USD) exchange rate has appreciated by 12.61 percent in the last 24 hours. Week-on-week, ETH is up 24 percent, while on a monthly basis, it is up 43.33 percent. As detailed in CoinDesk’s previous update, it looks as though ETH is still celebrating reports of upcoming access to its own regulated derivatives market. Meanwhile, comments on social media indicate investors are busy assessing the impact of the surge in transaction volume in the last 24 hours. 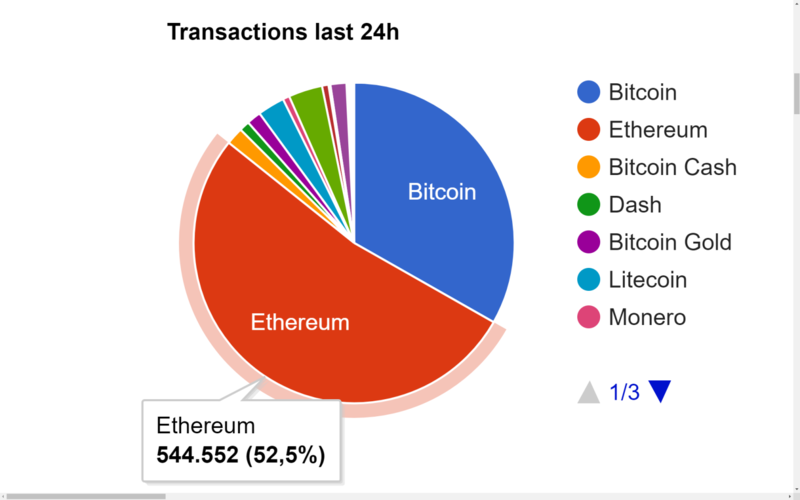 Ethereum is reportedly processing more transactions a day than all other cryptocurrencies combined.